Good Reputation-- we have decades outstanding achievement in the field of bartender kit, we are committed to solving the problems encountered by our customers while they using, nowadays, our cocktail shaker set is popular in most bars and bartending enthusiast. If you are also looking for 18/8 stainless steel cocktail shaker , this cocktail shaker set is worthwhile own. 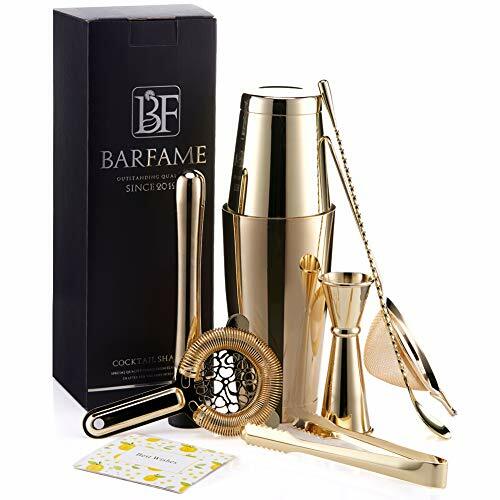 Why Choose Barfame Cocktail Shaker Set? Great Watertight Seal: Selected and tested by professional bartenders, two shaker tins fit perfectly to offer great watertight seal when shaking cocktails. Filter More Pure: with fine mesh conical strainer and high-density spring strainer, help you filtering drinks more pure. Exquisite Ice Tong: Newest 18/8 stainless steel ice tong with multi-grip teeth, durable and easy to use, perfect for gripping ice cubes or condiments. Perfect and Complete: All the bartender kit are complete and perfect, available for making various drinks, you don't need to spend time to buy anything else separately. Pat the shaker tin above appropriately after you complete it, it will help you open relaxed. ❤18/8 STAINLESS STEEL MATERIAL❤: Complete cocktail shaker set made of professional food-grade 18/8 stainless steel, prevent rust perfectly, clean easily, health protectly and durable. ❤PERFECT WATERTIGHT SEAL: This bartender kit has been selected and tested by professional bartenders, 18 and 28 oz boston shaker tins fit perfectly, offer the best watertight seal to you. Scientific cup edge designed, makes it easier to open. ❤BEST QUALITY: Superior stainless steel material with mirror finish, 0.7 mm thick and refined edge processing make it better to meet the need of professional bartenders. And unlike cobbler shakers, this boston shaker will not freeze shut, drip or spill as you pour your drink out. ❤PERFECT and COMPLETE SET: Different with other bar shaker set, this bartender kit has equipped with fine mesh conical strainer, designed to offer the purest drink to you; high density spring cocktail strainer fits boston shaker tins perfectly, you can filter drinks easily; 18/8 stainless steel ice tong with multi-grip teeth, perfect for gripping ice cubes or condiments. All the set are complete, you don't need to buy anything else separately. ❤WHAT WILL YOU GET: Premium package box with 18 and 28 oz boston shaker, 1×double jigger with 1/2oz, 3/4oz, 1oz and 1 1/2oz, 2oz, 1×high density spring cocktail strainer, 1×fine mesh conical strainer, 1×mixing spoon, 1×cocktail muddler, 1×ice tong, 1×recipes, 1×greeting card, 18 months warranty and lifetime warmhearted service. If you have any questions about this product by Barfame, contact us by completing and submitting the form below. If you are looking for a specif part number, please include it with your message. "Aura" Hammered Copper Cocktail Shaker, 30 Oz.